The contaminated water in Flint mobilized a nation, sparked visits from National leaders, and brought in donations and supplies from all over. The outrage had a focus - corroded pipes. What happens then, when the method of contamination is unknown? Or when it is basically your whole outdoor environment? 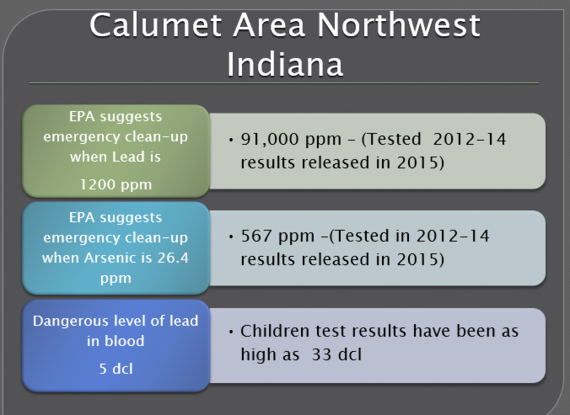 When soil samples and blood tests from an entire area of over 6,000 current residents who have been exposed to lead and arsenic levels come back well over what the EPA considers an Emergency clean-up? How does a nation begin to assist the thousands of families being displaced, given a 90-day notice to vacate not just their homes, but their schools? What is the plan from the Mayor, the Governor, FEMA, the EPA on how to reach and test those who lived in the Calumet Area of Northwest Indiana over the past three decades? Where is the medical community - knowing the exposure to arsenic and lead especially on the young and those who are pregnant? Where is the plan? The tweet? The headline? The town hall? The answer itself is a toxic mix of finger pointing, changing deadlines, paperwork, vouchers (for some), cleaning of Units (for some) and warnings to stay off the grass, the mulch, and basically don't touch anything that has touched the ground. And enter the people of the Region - the activists, BLM, clergy, local journalists and those who have been vocal for Human Rights. Nurses United have come to help. There are many informative blogs and updates, consider Great Lakes BioRegionalism, or the Northwest Indiana Byline Podcasts. While we wait and hope, that eventually our State and nation will turn attention to this major crisis, individuals are taking up collections for packing supplies, boxes, tape, moving supplies to assist our neighbors in relocating. Town halls and organizational meetings have been held, most without the leadership from the Mayor or Governor. Information is given, but implementing the suggestions will take much more assistance. We need help. The situation did not happen overnight. Two Lead Smelter plants operated in East Chicago until the seventies and DuPont Chemicals operated a plant which manufactured a pesticide containing arsenic. After these closed, a housing complex and a school - Carrie Gosch elementary - were built on approximately 50 acres of the 400-acre Superfund site. 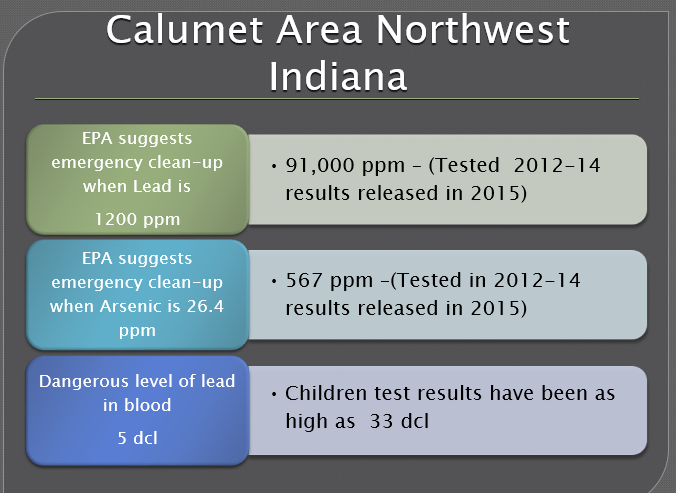 Despite concerns and testing - EPA reports from 2010 cited the dangers - the residents, including over 600 children, were never warned of serious dangers. Until now. The immediate need is to relocate the residents, to help clean the homes of those who wait, and to get people tested. The effects of these toxins will last a lifetime, and have affected the residents already. There is a need to find out who knew what and when and why they chose not to act. The warning signs have been there for decades. Health disparity among persons of color, or low income, or inner city are major factors in the Region. Could there be other causes for the health concerns? Indiana is 4th in Infant Mortality. 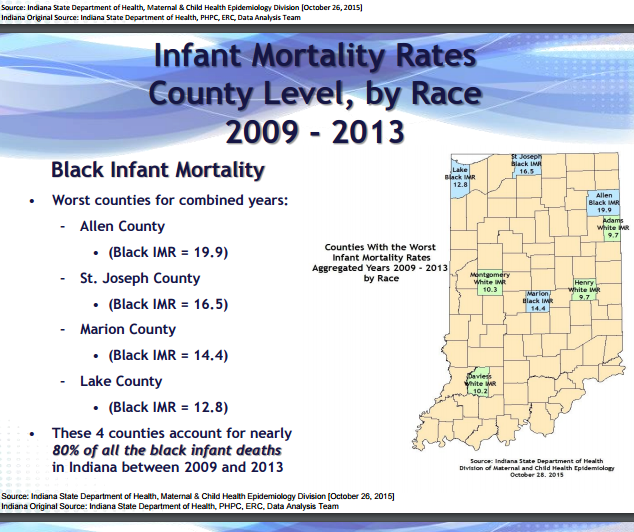 From 2009-2013, statistics from the Indiana State Board of Health cite the four counties of the Region, those bordering Lake Michigan, to have some of the highest levels for infant mortality of all 92 counties. Mindful the toxins are deep in the soil, and these plants were along the Lake. Lake, Porter, LaPorte and St. Joseph County all rely on Lake Michigan Water. 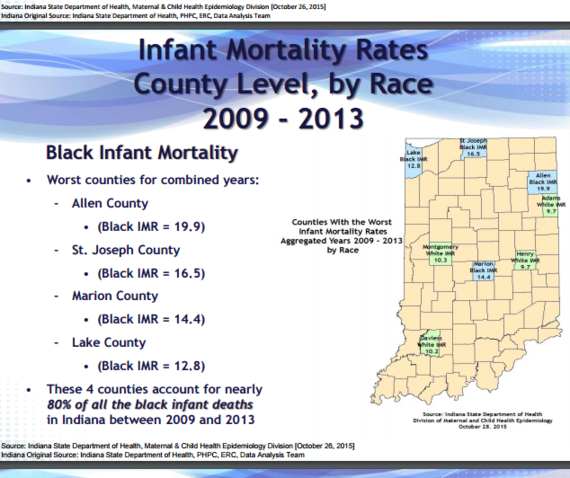 Looking at Counties, two of the Lake Michigan border counties are the worst for Infant Mortality among Black infants. 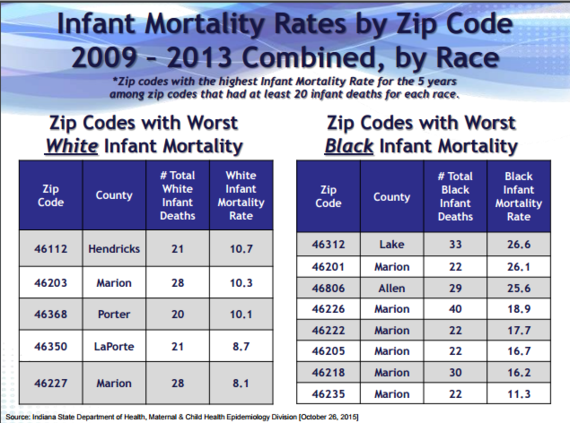 Narrowing it down further, Lake county, specifically zip code 46312 (which is East Chicago and the Calumet Area), has the worst Infant Mortality Rate among Black Infants. 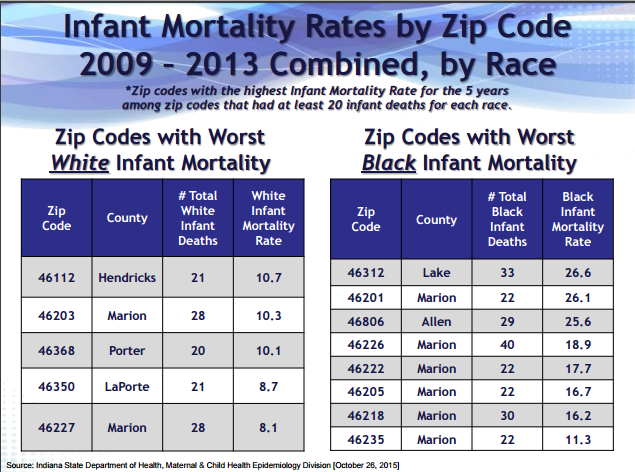 Porter County and LaPorte Counties have zip codes in the top 4 highest Infant Mortality for White Infants. Is there a connection between the contaminated soil and the waters of Lake Michigan to Indiana's high infant mortality? Other sources point to this possibility. Perhaps this latest crisis will prompt a study. Then again, perhaps the EPA and ISDH already DID study this and, like the report on the lead/arsenic levels, the results are on a desk in someone's office. As were the results from the EPA. While we help each other, with hands on boots on the (contaminated) ground, mayhaps the Media and others will step up and help us to discover the truth, the cause, and how we can make sure it doesn't happen to other areas.